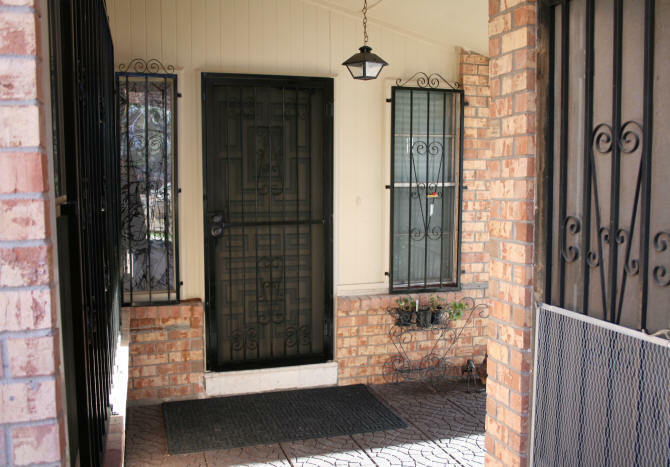 When I was working on the front door as part of my doors project, I took a really good look at the wrought iron screen door that shares the same door frame. Besides the obvious replacement of the screen, I wondered where the heck all of the holes in the frame came from. The answer was behind me on the garage screen door. There had been a screen guard (protector) on the door before. 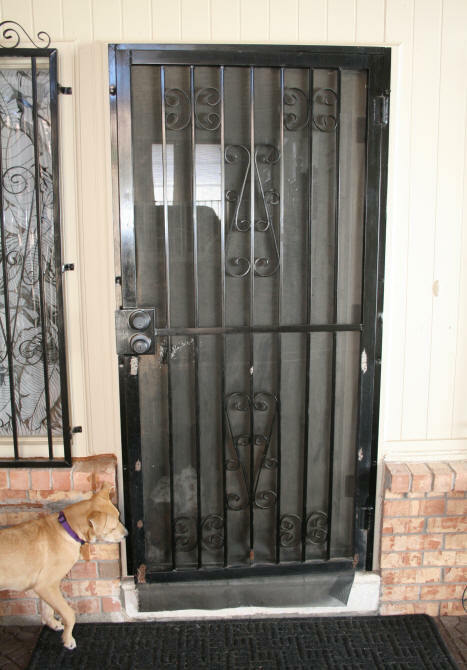 This did not make any sense for our doors because the dogs are usually on the inside of the house. I don't remember when the screen guard had been removed. All I knew at this point was, I had a lot of holes to repair. 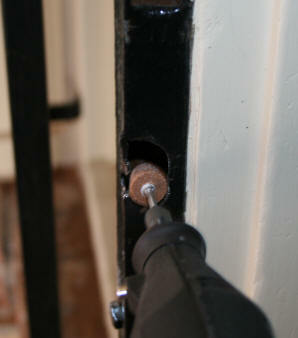 Holes in screen door frame after being grinded down by Dremel tool. Big tear in screen. 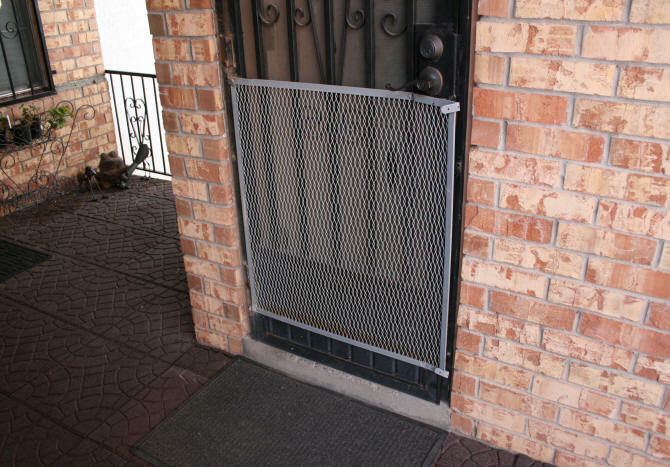 Screen guard on garage screen door. What created all of the holes on front door screen. While I was grinding off some rust on a neighboring piece of wrought iron a couple of months ago, I grinded down the hole areas of the screen at the same time. A little surface rust had started appearing, which I will sand off before I do the repair. The other problem with this door was the door knob. The latch does not go into the hole properly which means, if you don't have the deadbolt locked, the door pushes open easily. 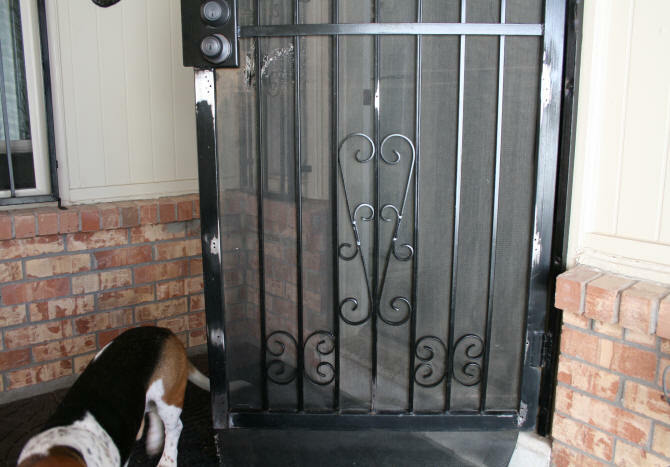 This is great fun for the dogs because they love to push the door open a few inches and watch it bang closed. They also used to get stuck outside when they all push through the door to get out to the front patio. They have just learned how to open it on their own from the outside by pulling on the bottom rail with their paws. I had told them to figure it out because I was tired of getting up to let them in. Needless to say, this had to be fixed. I will be grinding the hole larger at the bottom of the hole so the latch will extend all of the way into the hole. 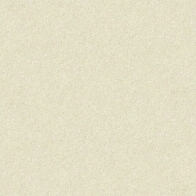 The other option is to lower the frame on the left side so the hole is lower. I will not use this option because the bolts on the frame are welded on. Welded on you ask? 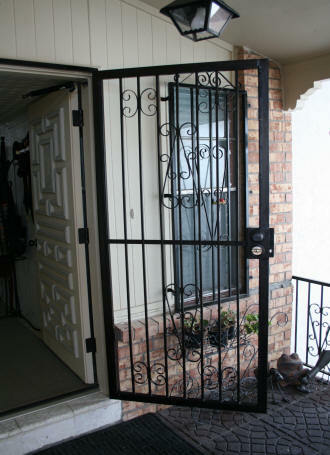 What makes wrought iron such a good option for security is the way the wrought iron is mounted. The bolts are usually 3" long mounted into the frame. The bolts are then welded onto the frame after the frame is attached. 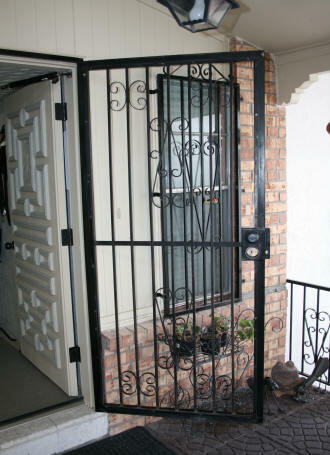 Wrought iron workers usually use a torch to remove the wrought iron. If a DIY'er does not have a torch, you have to grind the weld off the bolt to be able to screw it off. I already did this on one door. It was not easy. 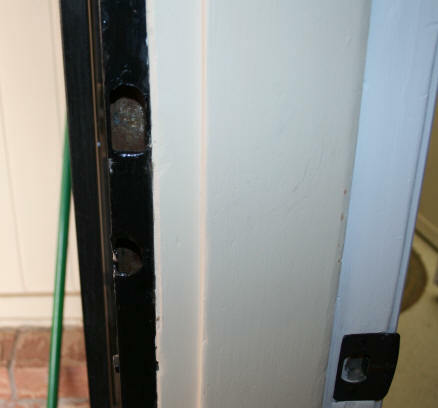 I wonder how many burglars ever carry around a socket wrench and sockets to remove 3" screws around windows or frames. Many years ago while I was in my 20's, I restored a 1965 Chevrolet Nova. I purchased the car, which ran great, for only $100. I lived in an area near the ocean where rust eats through cars as soon as there is a crack in the paint. The Nova had a lot of rust around the wheel areas. Fiberglass and Bondo were my best friends for doing this work. So I knew that Bondo would probably work best for filling the holes. First thing I had to do was re-sand the hole areas to remove the surface rust that had appeared on the surface. With Bondo, you need to have a clean surface that has been sanded down to the bare metal. First, I sanded down all of the hole areas with 80 grit sandpaper. I then wiped off all of the dust with a damp micro fiber cloth. 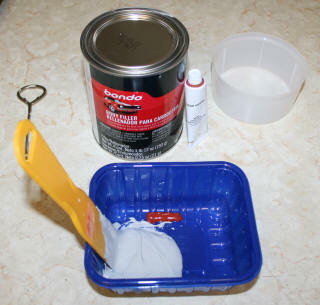 I then mixed the Bondo per the instructions on the back of the can. Is it just me? I swear the font size on these cans are getting smaller and smaller as the years pass. In bright light, I was just able to read it. It said for a golf ball size amount of filler, use 1 1/4" of the hardener. 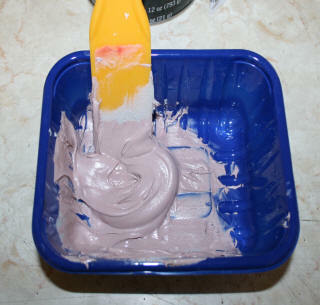 Then mix the two parts together until the color was uniform. I save plastic vegetable containers for projects like this, where I will just throw away the container after use. So I mixed the Bondo as instructed. It says it will harden quickly. I was not prepared for how quickly it hardened. Before I could get the first hole section on and smoothed out. The whole batch had already hardened. So back to the can I went and made a smaller batch. This time I worked quickly and just slapped the Bondo on the areas as fast as I could, not being too neat about it. Honestly, I do not remember Bondo setting this quickly 30 years ago. Screen door with hardening Bondo I waited until the Bondo had started to harden and then went to each hole area and scraped around the holes to remove the excess Bondo. The Bondo only took around 30 minutes to set. 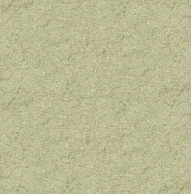 I then sanded the areas smooth with 100 grit sandpaper. Then sanded again with 180 grit sandpaper. The door was then painted with back enamel paint. 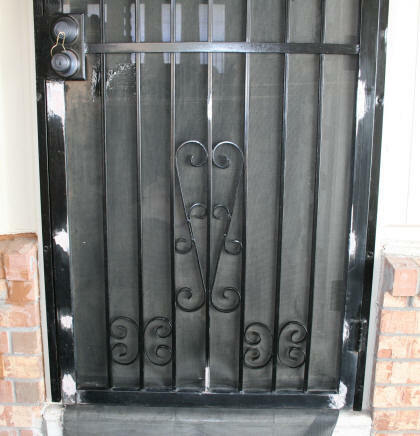 The same black I use on all of the wrought iron around the house. While the Bondo had been setting, I got to work on fixing the door knob strike hole. The door frame also has a deadbolt hole above it, which works fine. 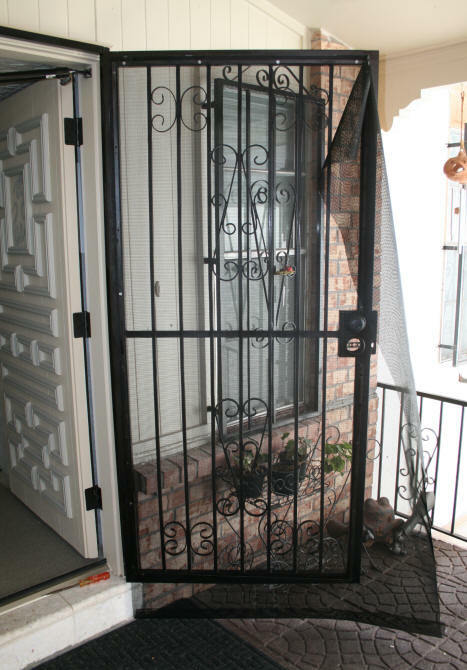 You will notice in the picture to the right that the wrought iron screen door frame does not have any strike plates. I set my Dremel up with a grinding stone and went to work on the lower hole. I only needed to remove a small bit of metal along the bottom. I put on my safety goggles and then let the sparks fly. You need to make sure there is nothing flammable around when doing this. 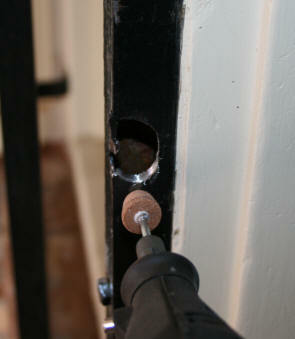 The hole for the door knob strike hole was grinded just until the strike would sink in properly. Now the door no longer pops open when you push on it. I guess the dogs will have to learn how to turn the door knob if they want to get out without my assistance. Fat chance of that happening. 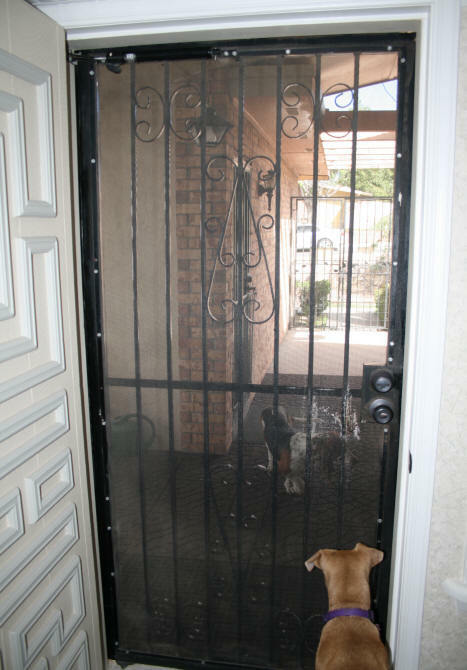 The screen on this door is held on with a thin strip of metal that goes around the edge of the door. This metal strip is attached to the door with 27 screws. I dreaded doing this because screws are my ailing hands worst enemies. Fortunately the screws are short. I used a socket wrench for the stubborn screws. In the picture to your right you can see all off the screws around the edge of the frame. After removing the screws, I pulled out the old damaged screen. I left the metal strip up on the frame with a few partially screwed in screws. I had to remove the door knob because the screen went behind it. I only had to loosen the deadbolt a little so the screen would slide out from behind it. 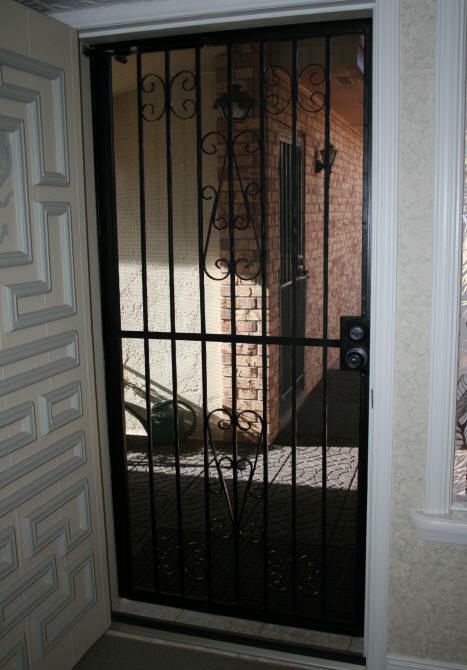 I wanted to avoid taking out the whole deadbolt because it can be a pain to get back on. Close-up of metal strip holding screen The other screen doors in this house have little strips of metal around the door knob section that holds the screen on. This door does not. Now that I had the old screen off, this was the time to do the touch-up painting on the wrought iron that lays flat against the screen. Since I am hoping that this screen will stay on for years, this was as good as time as any to paint it. I had already painted the outside when I repaired the holes. The new screen I was going to use was the same screen that had been removed. It is a brand that is supposed to be resistant to pet claws. It does actually work better than the regular fiberglass screens. But if you have dogs you know, nothing is absolutely pet proof. I bought this some time ago, so I was wondering why I bought the 48" width when I only needed 36". I believe this was the only width they had of this type of screen when I was at the hardware store. The 84" length was perfect. I did not like the silver screw heads because they look awful against the black frame. I thought about spray painting the screws before putting them back on. I knew I would probably scrape most of the paint off putting the screws back in. So I planned to paint the screw heads after the screen was installed. After the paint had dried on the screen door I started hanging up the screen. If you have someone to help you with this, that would be great. I did manage to do this by myself though. I started in the upper left corner. I put the screen underneath the metal strip leaving an excess of one inch of screen at the top and left side. I knew I would be cutting this off after. It was easy to see that it was straight this way. I held the metal strip with the screen underneath it firm against the door and then got the top left screw in. This is where a third hand would have been handy. Once this first screw was in, the rest was easier. I put on the screw in the upper right corner after stretching the screen a little and making sure I had one inch of screen extending at the top. I continued around the sides of the screen stretching and placing the screws in. 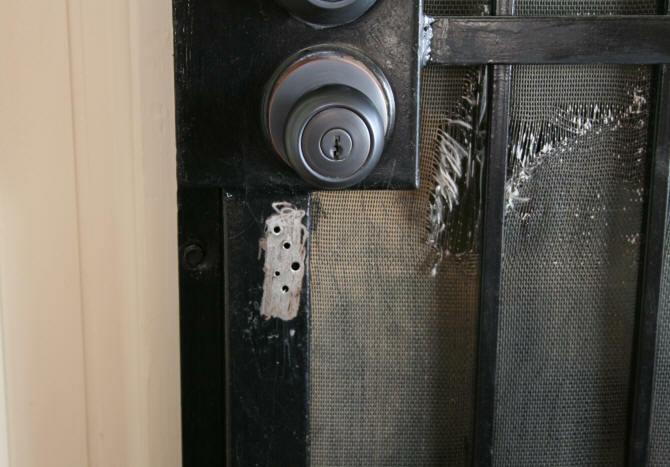 Around the deadbolt, I cut out a section of the screen and slid the screen behind the lock. For the door knob I cut a hole large enough for the lock mechanism and screws. The doorknob was placed back on over the screen. I saved the bottom screws for last, stretching the screen down before I inserted the screws. After all of the screws were in, I went around the perimeter of the screen with my socket wrench and made sure all of the screws were tight. I then took a sharp cutter and trimmed off the excess screen outside of the metal strip. I then reattached the hydraulic door closer. The last thing done was to paint over the screws with my black paint. The screws are no longer noticeable like they were before. Now if I can keep the dogs from tearing out the screen, I will be a happy camper.